Kilowatts per hour! A guide for the perplexed. Selecting the right Heat Meter. Paul Hoyle on Kilowatts per hour! A guide for the perplexed. Repairing a heat pump – How well is it carried out? This post is a little specific, and discusses the need for care and consideration when carying out any ‘major surgury’ on a heat pump. A little extra time setting the system up right will save considerable energy (and money) over its life. A domestic fridge will generally complete its useful life without encountering any problems within its inner workings (the refrigeration circuit). A refrigerant leak is almost unheard of. Ground and air-source heat pumps should also be able to claim such a high accolade, however, due to their added sophistication, component failures can happen, but they are rare. I was involved very recently with a system where a high-pressure sensor had ruptured. This caused a partial loss of refrigerant and resulted in a breakdown in the form of a low-pressure lock-out. Heat pumps (and fridges) hold a specific quantity of refrigerant (the heat-transfer working fluid). This is accurately weighed-in during manufacture, and thanks to good quality-control and all-welded joints, this weight should remain within the system throughout its working life. Any weight over or under the required amount can cause a reduction in energy-efficiency. Refrigeration equipment is slightly different to a package heat pump. In the past equipment had many mechanical joints and couplings – potential sources for leaks, big or small. Topping-up of refrigerant was expected, and the norm, after several years. Due to their design, refrigeration systems are generally less critical of refrigerant quantity – they have a ‘liquid receiver’ (a liquid storage vessel), and are generally topped-up until the sight-glass is clear of bubbles. On occasions when I have advised someone to engage a local refrigeration engineer to carry out a major repairs to a heat pump, I always say “make sure that they weigh-in the correct amount, as printed on the manufacturer’s label”. Recently, an engineer replacing the pressure transducer ignored this advice and simply topped-up until the sight-glass inside the heat pump was ‘clear’. The dilemma he could have had may relate to the time it would take to recover and evacuate what was currently in the system before weighing-in the correct amount. There is also a risk of contamination during recovery process. It gets even more complicated since the components of refrigeration blends (as per most current refrigerants; R407C & R410A) can leak at different rates, therefore the final percentage blend-mix of anything either left-in (or recovered) can be incorrect. · The energy-efficiency of a heat pump is paramount. · Any refrigerant added may be ‘sealed-in’ for up to 20 years, so ensuring that it’s ‘right’ (for highest energy-efficiency) is essential. · The refrigerant charge is generally more critical for heat pumps. Whether the afore-mentioned engineer did the right thing or not, I cannot say. However, using a sight-glass alone can a little risky. If any other part of the system is ‘out of tune’, this could affect the verdict of the sight glass, and could result in a diminished performance. Whilst the risk of this might be low, I have come across more than one system that was grossly over-charged. This causes the condenser (the hot heat-exchanger) to be flooded with refrigerant- effectively leaving a very small working surface area for condensation resulting in damagingly high temperatures and pressures, and poor energy efficiency. It is hard to say how many repaired systems out-there are given the correct charge, and hard to know if, or how much this translates to a reduction in COP, and I don’t want to worry those who have had repairs carried out; most engineers are both capable and conscientious. On the other hand, I wonder how long the old-school attitude of the refrigeration engineer will plague our heat pumps in the field. Air conditioning comes somewhere in between refrigeration and heat pumps. Systems are fairly fussy about refrigerant quantity, but bizarrely, to my mind, the pipe connections used are still the old copper ‘flare’ screw-together type. Whilst often a 99% seal, they can leak, and can ‘weep’. Why on earth there is not a requirement to use a more secure pipe joint eludes me. Surely due to this, there are many air-conditioners and air-air heat pumps that are operating well below of their optimum with a low refrigerant level. It’s very difficult for the owner to know if a system is energy-inefficient. To finish my dig at the old-school ways of refrigeration engineers, I fairly recently watched an engineer weigh-in the correct charge of refrigerant. Great I thought, but when he got to the required level (calculated in his head! ), he added a bit for luck! Why did he do this?! Maybe being helpful to allow for any futures seepage. But this extra amount will potentially reduce the efficiency. Maybe a fresh look at the importance of getting our systems optimised and energy-efficient is needed. Since refrigeration issues are rare, it is quite common for a local engineer to carry out the repair on equipment that they have no experience of. 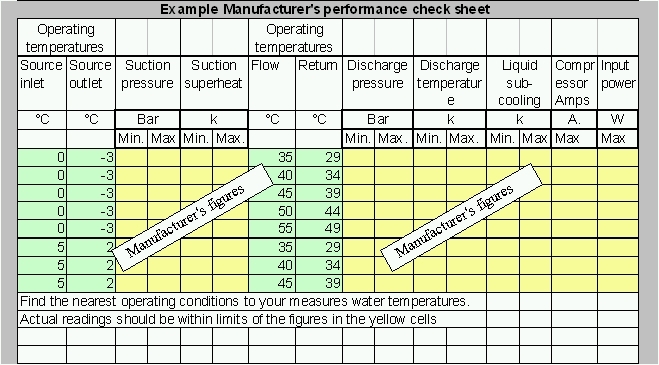 It would be helpful for all manufacturers to provide charts similar the example below to help any engineer to ‘gauge’ if the refrigerant charge is correct without needing to recover and weigh-in. It would also server as a performance health-check for the system. It should be tucked in a plastic wallet inside the unit. hi hunting for information re soft starts. have gshp with water and anti freeze loops, not quite 5 years old. soft start gone and flow temp display also packed up. quoted nearly £800 – 1000 to repair!!! 6 other residents have had soft starts go within less time than mine. is there something wrong with installation do you think and more important how necessary are they. v well insulated open plan house, rads upstairs only. only 1 zone out of 3 on – could that have caused it? concerned about v loud noise from pump before turned off – could compressor be compromised do you think? Not sure what soft start you have, but one would not expect failures. ( have never know a failure from the Alco Emerson/copeland soft start). If few zones open, are you short-cycling? How many starts per hour? The soft-start will no doubt need a cooling period between starts. Re noise- some scroll compressors rattle briefly when they stop, and it sounds worse than it is. Shame when little details like a soft start cause a break down. They should be robust enough to even cope with fault conditions. Thank you so much for response. I so need to talk to an impartial person who understands the system. I have Carlo Gavassi soft start and now know 5 out of 8 at this site, and similar proportion at a nearby site with same make of soft start, have packed up within 2 or 3 years of installation – I've done quite well to reach nearly 5. Builders just wire round them, which I understand will shorten the life of the compressor and can cause supply problemsdata loss etc and that electricity suppliers don't like it done? I get 10 hours cheap electric with Scottish Hydro so my pump comes on at 5.30 am off at 7.30 am, on at 1pm off at 4pm, on at 8.30pm and off at12.30 and because I've set the thermostat on the manifold at 35 the pump is on throughout those times and the underfloor heat is just lovely. Doesn't do any on off – I can hear the clicks as I live alone and don't have tv on. However I now know that on the morning of the day I heard it onoffonoffonoff at 8.30pm, the neighbours had heard the compressor crashing around and vibrating the building from 5.30-7.30am, we were all out for the lunch/early afternoon session; that evening I turned it off as it was clearly unable to start, though it tried. Thanks, I have found a local supplier for the soft start you mention, but have now found someone willing to wire around the soft start to avoid it altogether, so we can at least start the system up and have a listen to the compressor. Iam in no position to fix outflow temp readout and soft start and find compressor knackered. Don't know how much harm this will do to system if it is left like that on a permanent basis, no soft start I mean? I am on single phase electric by the way. In the meantime I am nearly 3 weeks into no heat and no knowledgable advice or engineer. You feel like a lifeline. It's very disappointing for all concerned, but I think there is a bigger issue here. If more than 50% of gshp and air source soft starts are failing within a few years what is going on? It makes claims of low maintenance a nonsense. Is there some sort of forum where gshp owners can air problems, discuss possible causescures etc etc? I fell bad emailing you but it is such a relief to find someone who isn't trying to sell you something. The Alco soft start is designed specifically for the Copeland Scroll compressor, so make sure its comparable. It sounds like your system didnt have a delay-start timer. No system should stop/start/stop/start, and its a sure way to burn out a soft start. The Alco has a built in delay to protect itself, but any good quality delay-start module should do. Previous Previous post: How energy-efficient should a heat pump be?